In this photo provided by the office of former President George H.W. Bush, the former president waves to supporters as his motorcade arrives in Kennebunkport, May 20, 2018. Bush, 93, was hospitalized Sunday for low blood pressure and fatigue, a spokesman said. Former President George H.W. Bush was admitted Sunday to Southern Maine Health Care in Biddeford after experiencing low blood pressure and fatigue, according to a family spokesman. He is expected to remain there for a few days, spokesman Jim McGrath said in a tweet shortly after 2 p.m. Sunday. “The former president is awake and alert, and not in any discomfort,” McGrath said. 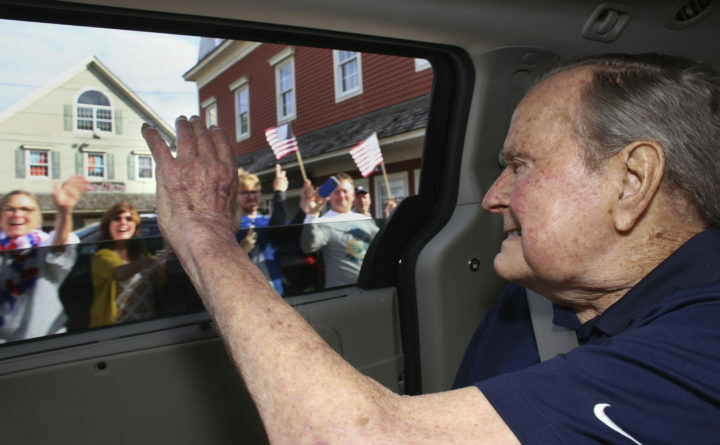 Bush, 93, arrived in Kennebunkport on May 20 to spend the summer at the family estate on Walker’s Point. His wife of 73 years, Barbara Pierce Bush, died April 17 in Houston at age 92. Shortly after her funeral, Bush was hospitalized for a blood infection. Bush has visited the family compound at Walker’s Point for part of every summer since childhood, with the exception of his time as a naval aviator in World War II, according to The Associated Press. On Saturday, he attended the monthly pancake breakfast at the American Legion Post 159 in Kennebunkport with former National Security Adviser Brent Scowcroft.